Tastes good with curd rice, sambar rice & rasam rice..
Marinate the chicken in batter for 20mins and fry it in oil until golden brown color. Heat oil in a pan and saute onion until brown color. Add ginger & garlic paste and saute until the raw flavour of it leaves. Add soy sauce, ajinomoto, red chilly paste, sugar, salt, tomato sauce, coriander leaves, color powder, spring onions, fried chicken, pour water and close it with a lid, cook it until the chicken becomes tender. To get thick gravy mix corn flour in water and add it to the chicken and cook for few minutes. Garnish with coriander leaves ,spring onions & drops of lemon juice. Nalla recipe Rajesh . Thank U . Ginger Chikenuku 3 tsp ginger podhuma . ? ? ? 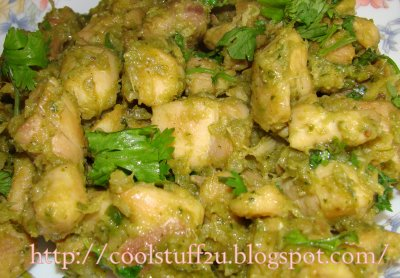 A Wonderful Garlic Chicken recipe Rajesh!.